The National Federation of Sea Anglers (NFSA) held an EGM at Buckfastleigh in Devon on Saturday, 6th December 2008 at which the membership approved proposals to allow the winding up of the NFSA and the transfer of its assets to the Angling Trust. "The NFSA is proud to be a part of the formation of the Angling Trust. Sea anglers share an interest in many issues with their freshwater counterparts and we will be much stronger if we pool our resources. The new Angling Trust will build on the work we have undertaken for many years, lobbying for greater protection for marine fish stocks and running national and international competitions on and off shore." "The Angling Trust will not only continue the work of all these bodies, but it will also do much more. We will now be able to represent all anglers much more efficiently and effectively. All the staff of the organisations involved are working flat out to make sure that everything is in place for the launch in January. We all hope that every angler's New Year resolution will be to join the Angling Trust." The Angling Trust's interpretation of the current Minimum Landing Sizes set by the EU ("EUMLS") is that they only apply to motorised vessels holding a commercial fishing licence and not to recreational catches. However, the Angling Trust encourages all anglers to apply voluntary minimum retention sizes which exceed the EUMLS and allow all fish retained the chance to have bred at least once. The EUMLS are set out in Annex XII of Regulation 850/98 (Table 5). For both finfish and shellfish undersized animals are not to be retained on board, transhipped, landed, transported, stored, sold, displayed or offered for sale. Undersized animals must be returned immediately to the sea. Angel sharks (Monkfish) are listed under Schedule 5 of the Wildlife and Countryside Act 1981 and protected against killing, injuring or taking under section 9(1) on land and up to 3 nautical miles from the English coast. Allis and Twaite Shad are protected under Schedule 5 of the Wildlife and Countryside Act 1981 and EU legislation (Berne Convention) and all fish must be returned. Undulate ray, porbeagle and spurdog are classified as endangered and the Angling Trust recommends that all such fish are returned alive. The regulations banning the retention and killing of European eels have caused some confusion over whether eels can be retained for weighing and measuring in competitions. In order to clarify this, the Angling Trust has produced a recommended code of practice for anglers. The Environment Agency byelaw states that anglers are allowed to retain eels to weigh or measure them before releasing them alive into the same water on completion of fishing. The Angling Trust recommends the measuring or weighing and immediate release of any eels in order to minimise any distress to the fish and avoid falling foul of the law. In circumstances where eels must be retained for weighing or measuring appropriate measures should be taken to keep the eels alive, such as the use of keepnets, keepsack. Remember, eels must be kept cool and wet, with minimum levels of water (almost none) OR have a good flow of oxygenated water. Eels will produce lots of excess mucus when confined so change the water regularly or they will suffocate. Don't try and remove the hook from deep-hooked eels. Cut the line as close to the hook as possible before releasing. Anglers should be aware that it is their responsibility to keep any eels retained alive before releasing them and that any dead eel in their possession would be a criminal offence. Before retaining any eels during a match check the rules with the organiser first. The Angling Trust recommends all matches operate immediate release following measuring by a fellow competitor or steward. The following recommended retention sizes have been set at, or above, the highest regional minimum size set by any one of the Inshore Fishery and Conservation Authorities ("IFCA"). Following these recommendations will ensure that anglers and clubs are not in contravention of any local bye laws set by IFCA. An Environment Agency byelaw prevents anglers from retaining the European eel (Anguilla anguilla). However, they can be retained for weighing or measuring but must be returned alive to the water they were taken from on completion of fishing. Undulate ray are classified as endangered. The Angling Trust recommends that all fish are returned alive. Shad are now protected under the EU (Berne Convention) and all fish must be returned alive. Angel sharks (Monkfish) are listed under Schedule 5 of the Wildlife and Countryside Act 1981 and will be protected against killing, injuring or taking by section 9(1) on land and up to 3 nautical miles from English coastal baselines. Porbeagle are critically endangered in the north-east Atlantic. The Angling Trust recommends that all fish are returned alive. Spurdog are classified as critically endangered in the north-east Atlantic and The Angling Trust recommends that all fish are returned alive. Anglers should be aware that there is a national restriction on landing tope caught from a boat, which includes kayaks, by rod and line. Any boat-caught tope are legally required to be released as soon as possible after capture. Should there be any dispute on the measurement of a fish the Match Organisers Master Measure will be the deciding measure. All fish are to be measured from the tip of the snout to the end of the tail fin, except Skates and Rays which are to be measured wing tip to wing tip. All sizes are in centimetres or kilograms where indicated. Clubs operating catch and release matches may, of course, set size limits below these recommendations and include species which we recommend be returned. In such circumstances it is the individual anglers responsibility to ensure that fish are returned alive to the water from which they were taken. The information above was correct at the time of publishing and should be used as guidance only. The Angling Trust accepts no responsibility for changes to its accuracy by 3rd parties. We recommend that anglers and clubs check with their local IFCA for any changes to the information provided above. Minimum Landing Sizes ("MLS") are used all over the World and are just one of a number of tools used to manage fish stocks. However, as a common sense approach to conservation and an easy concept to understand (protecting immature fish) they have been adopted by responsible recreational anglers with an interest in conservation and sustainable management of fish stocks. As part of the latest reform of the EU Common Fisheries Policy an obligation by commercial fishermen to land all catches was introduced (commonly known as the discards ban). As a result the EUMLS could no longer apply and were replaced by "Minimum Conservation Reference Sizes" ("MCRS"). Fish below the new MCRS must be landed but the fish cannot be sold at market for human consumption, thereby creating a market force which is intended to discourage fishermen from catching smaller, immature fish which must be landed but have very little market value. However, there must also be an incentive to land these fish, if caught, to comply with the landings obligation and not to continue to discard dead fish at sea. Therefore a very fine balance must be struck by the EU which discourages immature fish from being targeted while simultaneously encourages fishermen to land them by providing a limited financial reward. The obligation to land all fish caught only applies to species for which there is a quota or a Total Allowable Catch ("TAC"), apart from in the Mediterranean where all non-TAC species must be landed. For other species it is up to each member state within the EU to decide whether or not to maintain minimum landing sizes or include them in the landings obligation at a national level and introduce a minimum conservation reference size. where so prescribed, the EUMLS were set below the age of sexual maturity for those species (females) thereby preventing fish from spawning, completing their lifecycles and contributing to the future species stock. The lifecycles of some species, and the fishing methods used, mean that MLS alone are rarely enough to secure good fish stock management. More is needed and in most cases of successful fisheries management (including the restoration of depleted stocks) where EUMLS play a key rôle, other technical measures are used as well e.g. minimum mesh sizes for nets to avoid by-catches of small, immature fish. inapplicable to recreational anglers (save on a voluntary basis). However, a number of EU member states rigorously apply the EUMLS to both commercial and recreational fishing and some member states have even set MLS for recreational fishing which exceed the EUMLS, while requiring commercial fisheries to follow the EUMLS e.g. the French bass fisheries. The Angling Trust encourages all anglers to Give Fish A Chance and apply voluntary minimum retention sizes which exceed the EUMLS thereby ensuring that all fish retained have had an opportunity of breeding at least once. If an IFCA has not set its own MLS or MCRS (see IFCA "Finfish" table below) the following EUMLS apply to a limited number of species caught in UK waters. For many species no EUMLS or MCRS have been prescribed. With conservation in mind, the Angling Trust has prescribed approximate sizes of sexual maturity for females of all species using the best available evidence to support such sizes. Where a size range is given the Angling Trust has prescribed the upper limit of that range. These are not recommended retention size limits but anglers retaining fish above these sizes can be reasonably confident that these fish will have had an opportunity of breeding at least once. The size of sexual maturity for species from the Gadidae family including cod, whiting, haddock, pollack and coalfish (saithe) can vary wildly depending on a number of factors. The figures quoted represent the size at which 50% of fish of these species have reached sexual maturity. An Environment Agency byelaw prevents anglers from retaining the European eel (Anguilla anguilla). However, they can be retained for weighing or measuring but must be returned alive to the water they were taken from on completion of fishing. For the Angling Trust's policy on retaining European eels click here. Undulate rays are classified as endangered and, for that reason, the Angling Trust recommends that all undulate rays are returned alive. Shad are now protected under the EU Berne Convention and all fish must be returned. Monkfish (aka angel shark) are listed under UK Wildlife and Countryside Act and are protected against death, injury or taking (section 9(1)) on land and up to 3 nautical miles from the English coastal baselines. These are not to be confused with the unprotected Anglerfish (Lophius piscatorius) whose tails are marketed as monkfish. Porbeagle are critically endangered in the north-east Atlantic. The Angling Trust recommends that all porbeagles are returned alive. Spurdog are classified as critically endangered in the north-east Atlantic. The Angling Trust recommends that all spurdogs are returned alive. Anglers should be aware that there is a national restriction on landing tope caught from a boat, which includes kayaks, by rod and line. Any boat-caught tope are legally required to be released as soon as possible after capture. Details of the Tope (Prohibition of Fishing Order) 2008 can be found here. In order for bluefin tuna to be caught directly, each Member State must apply for a quota and then apply a second specific quota for recreational fishing purposes. The UK does not currently have a quota for the direct commercial or recreational fishing of bluefin tuna. Therefore, direct fishing for bluefin tuna is not allowed in the UK under current regulations. Article 12.5 of Regulation 302/2009 states that "Each Member State shall take the necessary measures to ensure, to the greatest extent possible, the release of bluefin tuna caught alive, especially juveniles, in the framework of recreational fishing". Therefore, recreational sea anglers are obliged to do everything they can to ensure any bluefin tuna by-catch is returned to the sea alive. In England the Inshore Fishery and Conservation Authorities ("IFCA") have considerable responsibility for managing fish stocks out to six miles from the shore. While IFCA still have to adhere to the rules laid down by the EU Common Fisheries Policy they are able, through bylaws, to set MLS which exceed the EUMLS and apply to all fish retained, including those caught be recreational anglers. Minimum legal sizes: ALL FISH BELOW THESE SIZES MUST BE RETURNED IMMEDIATELY TO THE SEA: Council Regulation (EEC) 850/98, Statutory Instruments. Unless specified all measurements apply to the dimension of length. Those that sell, offer or expose to sale, or exchange for any other goods Bret or Turbot under sixteen inches long, Brill or Pearl under fourteen, Codlin twelve, Whiting six, Bass and Mullet twelve; Sole, Plaice and Dab, eight, and Flounder seven from the eyes to the utmost extent of the tail, are liable to forfeit twenty shilings by distress, or to be sent to hard labour for not less than six, or more than fourteen days, and to be whip'd. Those who unlawfully break down fish-ponds, or fish therein without the owner's licence, are liable to three months imprisonment, to pay treble damages to the party aggrieved, and to be bound to good behaviour for seven years. Every one who between the first of March and the last of May shall do any act whereby the spawn of fish shall be destroy'd, shall forfeit forty shillings and the instrument. On 1st August, 1948, the Sea Fishing Industry (Immature Sea Fish) Order came into force. This lays down that the landing and sale of fish of less than the following sizes is prohibited. "Any person landing, selling, exposing or offering for sale, or having in his possession for the purpose of selling, any fish of the above descriptions of a smaller size than is stated above is liable to a fine not exceeding £50." At the time of the appearance of the Order and for some time after it, it was generally considered that its provisions did not apply to anglers. It has since been ruled in a Court of Law that the Order does not apply to amateur anglers. In addition to this Ministerial order, local Sea Fisheries Committees have by-laws covering species of fish not mentioned in the Order, and anglers are advised to find out whether any such by-laws govern angling in their own areas. While this Order is mainly for the professional fisherman, the sea angler must see that any of the above fish, less than the minimum size stated above, are returned to the sea, otherwise he could be liable to the penalties laid down by the Order. 1. Where can I fish, and what for ? The Sea Fishing Industry (Immature Sea Fish) Order (1968) sets out quite clearly the species which are protected, and the size below which it is an offence to land them. Obviously no one is able to avoid catching small or immature fish, and there is certainly no offence in doing so, but - and this is most important - an immature fish of a protected species should be released and returned to the sea alive as soon as possible. … Remember that you, the fisherman, are required to know the law. … the National Federation of Sea Anglers ask all who belong to affiliated clubs not to keep black bream measuring less than 9in or bass less than 15in from tail fork to nose. Similar restrictions apply to species such as conger eel, dabs and garfish which have NFSA size limits of 28in, 8in and 15in respectively. The above list is not complete. Various species of shark have not been included and, of course from time to time, modifications can be, and are, made to such lists. The SSACN would like to remind all anglers fishing in Scottish waters that they must release any of the following: Angel shark, common skate, white skate, porbeagle, spurdog, knifetooth dogfish, sailfin roughshark, greater lanternshark, undulate ray, leafscale gulpershark, portuguese dogfish, blackmouth catshark, longnose velvet dogfish, black dogfish, greenland shark, six-gilled shark, velvet belly, deep-water catsharks, frilled shark, birdbeak dogfish, kitefin shark, tope. According to www.worldseafishing.com a codling becomes a cod when it is mature enough to breed (at around 5 years old). Back in the 1970s that was above 10lb, but overfishing has caused a shift in the gene pool that favours individuals that spawn early which has reduced this weight considerably. Mature cod are around 50cm (20 inches) in length. The "legal" size for landing cod (codling) is 35cm (14 inches). There is no official weight and no such fish as codling - it's just a name given to an immature cod. The change from codling to cod occurs when the codling reaches sexual maturity and is capable of reproduction, the weight being irrelevant. 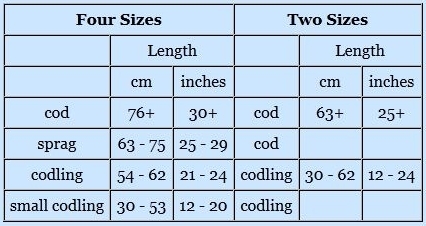 Under both the four and two size range systems operated by the FAO, codling of a length greater than 62 cm (24 inches) in length are classified as cod. "The rate of growth varies considerably from ground to ground, depending on the food available and the temperature of the water, but in the North Sea for example a one-year-old cod will attain a length of 7 to 8 inches, a two-year-old will be 14 to 17 inches and by the end of the fourth year will be 24 to 27 inches long. North Sea cod usually reach maturity when three to five years old, but some may take only two years, others in Arctic waters as long as six to eight years. Growth is generally slower in colder water, and the average size of the adult cod is often less than in more temperate waters; for example a typical six-year-old cod from Bear Island would be about 25 inches long and 4 to 5 lb in weight when gutted, whereas a cod of the same age from the North Sea could be 34 inches long and 12 lb or more in weight. Five-feet-long cod from the Newfoundland area are usually 18 to 20 years old." See FAO report "The Cod (2001)", section "Size". the approximate size of sexual maturity for species of the Gadidae family - including cod (60cm: 23½ inches), whiting (30cm: 11¾ inches), haddock (40cm: 15¾ inches), pollack (50cm: 19½ inches) and coalfish (70cm: 27½ inches) - can vary wildly depending on a number of factors. With conservation in mind, and using the best available scientific evidence, the Trust has identified these approximate sizes of sexual maturity for females of species of the Gadidae family which represent the size at which 50% of those species have reached sexual maturity. The Trust emphasises that these are not recommended retention size limits, but anglers retaining fish above these sizes can be reasonably confident that these fish will have had the chance to have bred at least once. As far as the amateur is concerned, large cod form the exception on our coasts rather than the rule; the rod usually taking only codlings, ranging from 2 lbs. to 6 lbs. These nevertheless afford most excellent sport, and eat, if anything, better than their elders, owing to their being cooked whole, and the consequent obviating of that cutting up that so spoils fish for the table; for which reason too I should always select a small turbot in preference to a few pounds of a large one, of which all the goodness is perforce left in the fish-kettle. … the young cod, now an inch long, come shorewards and feed and are fed on, many millions doubtless being eaten by larger fish and sea birds. When a year old they seek deeper water. Fishermen call anything under twenty inches codling, from twenty to thirty inches sprags, then come half cod and then cod. They are such voracious feeders, and the sea is such a good feeding ground, that their growth is undoubtedly very rapid. According to Jackson, some cod which were in the Southport Aquarium grew from three-quarters of a pound to six or seven pounds each in a period of about sixteen months, and they would without much doubt grow still faster in the sea. It has always been a puzzle to the writer to know where a cod begins and a codling leaves off. Most sea-anglers, if other people catch such fish, call them codling; should they happen to fall to their own rods, they call them cod. The safest system seems to take the average of sexual maturity (3½lbs to 5lbs), and then to call all over 5lbs cod. Small (cod) fish, ranging in weight from about 5lb downwards, are known as codling. … The cod then continue their growth at a great pace. 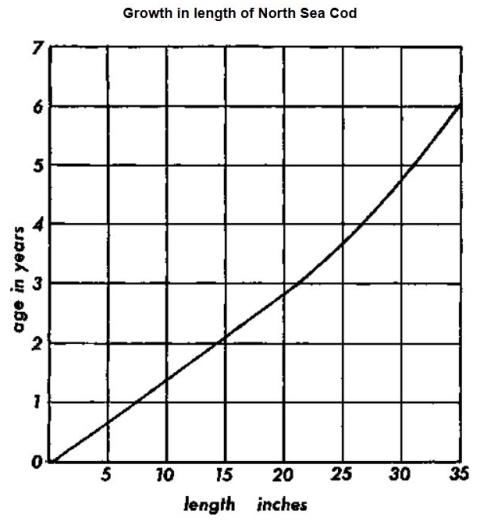 At one year of age they average about 5½ in, and (according to Cunningham) 10 in to 12½ in at two years, 17 in to 18 in at three years, and 27 in at four years. By the time that the females have reached that size they are coming to maturity, and the males have usually attained years of discretion at a smaller average length. … In the North Sea the study of the results of trawling prosecuted by the Scottish Fishery Board affords some evidence that codlings (as the immature but marketable cod are called) are to be found in the shallower waters near land so long as the weather still has some warmth; but when the water has been thoroughly chilled the large full-sized cod are found (probably with a view to spawning) near the land, while the codlings are out in deeper (and slightly warmer) waters far away to sea. On the coasts of England and Ireland there are often in autumn and early winter enough cod to be found to give amusement to amateur fishermen, though not enough, if it were not for other fish, to afford a livelihood to the professional hookers. … It has been remarked that the cod found in the south part of the Flemish Bight and the eastern end of the English Channel are stouter built and heavier, length for length, than those of the Dogger Bank, but until marking experiments have been carried out to a considerable extent it would be premature to postulate that the "Downs' Cod" are, in fact, a separate race from their northern kinsfolk, though decidedly there is a marked difference in appearance quite obvious even at a casual glance. As evidence, for what it is worth, that the Downs' cod are local it may be mentioned that after a great scarcity for some seasons an enormous number of codlings from 20 to 24 inches long made their appearance in 1908; the next year there were many fish about 5 lbs in weight, and the following winter captures of thirty to fifty full-sized fishes of 10 lbs and upwards were often made by the long-liners. There is a proverb which says, "Do not prophesy unless you know", but it does not deter me from risking the prediction that if fishermen will try the cod-grounds near the South Goodwin Light and in Old Stairs Bay in November and December, 1911, they will find some large fish waiting for them. Perhaps the most outstanding feature of the fishing at Ballycotton in 1919 was the presence in those waters of very large numbers of codling, quite an unusual feature there. It is hardly an exaggeration to say that the bottom of the sea was fairly paved with them, the fish usually ranging in weight from 2lb to about 5lb or 6lb apiece - a state of things which the writer believes to be due to the great diminution in trawling during the war. There has always been a moot point connected with the weight of this fish, viz., at what size it ceases to be a "Jack" and becomes a "Pike". Walton says at two feet; Sir J. Hawkins at 3lbs. ; Mr. Wood at 2lbs. ; Salter at 3lbs. ; Hofland at 3lbs., or when it exceeds 24 inches in length; "Piscator" ('Practical Angler') says 4lbs. ; "Glenfin," 3lbs. ; Mr. Elaine, 4 or 5 lbs. ; Carpenter, 3lbs. ; "Ephemera" 4lbs. in his notes to Walton, and 3 or 4 lbs. in his 'Handbook of Angling'; whilst Captain Williamson recognizes no distinction, but, calls them indiscriminately Pike and Jack. Under these circumstances and considering that the distinction unlike that between the Salmon and Grilse is purely arbitrary, it would appear to be desirable that for the future an 'act of uniformity' be passed; and as the majority of writers seem to favour the 3 pounds qualification, that standard might perhaps be in future adopted by general consent as the point at which the young Pickerels cast off the Jack and assume the full dignities of Pike-hood. The fish reaches maturity at the end of four years, when well grown specimens may weigh 7 to 10lb. In the late autumn run on our east coast many codling of these weights are taken by anglers fishing from pier or beach, as well as from boats. A hefty codling of 6 or 7lb, though it may not do anything wildly exciting, yet makes quite an excellent fight. And afterwards, cooked fresh from the sea, it is a dish beyond all praise. Young cod, which are often very variable in their markings, are known by many names locally. There is no hard-and-fast rule as to when the fish can aspire to the name of cod, but it is generally taken that, unless they can turn the scales at 6lb, they must be referred to as codling. No one in authority has yet laid down when a codling becomes a cod, but cod below 4 to 6 lb - the standard changing with the locality - are classed as codling. They are extremely useful fish for the shore angler, for though they give no more sport than their elders, they are very numerous, and fill the bag and the pot during the winter months. Editor's note: metric conversions added for comparison purposes. (E.W.L.) Holt gives the minimum length of mature cod (both sexes) in the North Sea as 22 inches, and the length of the largest immature cod as 35 inches … It would seem, therefore, that in our waters some (the more rapidly growing) cod become mature at three years old, when 22 to 23 inches in minimum length, while an occasional fast-growing male fish may become mature at as little as two years old. But some cod are five years old, or even older, before becoming mature. … By and large, however, the greatest number of cod taken by the sea angler will be fish averaging 3 to 4lb in weight, and these go under the name of codling. John Bickerdyke classified codling by length and not by weight, and called a fish under 20 inches a codling, a fish between 20 and 30 inches a sprag, and thereafter half-cod and cod. … The rod-and-line angler, however, can count himself lucky when one of his fish tops the 10-lb mark, and in fact most of those caught from the shore will be considerably smaller. Those under 6 lb are generally referred to as codling. (Cod) … may run to large weights, and, although anglers prefer the smaller fish (called codling for eating), the larger fish do provide good winter sport for the hardy. Just when a codling becomes a cod is a matter of opinion. It appears to be left to the angler and how good a tale he wants to tell. Generally anything under 5lb is termed a codling. When a codling becomes a cod has long been a source of argument and differs widely from place to place. In most areas anything under 6 to 8 lb is classed as a codling or tamblin while in others nothing under 10 to 11 lb would be deemed worthy of being called a cod. Codling, fish between 1 and 6 lb, are caught around the south-east coast during March and April. By May they have usually departed, though the exact time depends, of course, upon weather and temperature. Following the arrival of shoals of herring and sprat in the autumn, early October usually sees the return of the larger cod, i.e. fish above 7 lb. During the Christmas and New Year period the run is often at its height and some fantastic sport can be enjoyed by beach anglers. … January, the big cod move off-shore to the deep spawning areas, but there will still be hordes of immature codling from about 1 lb to 7 lb for the beachcaster and rock angler. Small cod, those up to about 6lb, are known as codling and are very sweet for the table. No matter what their size they can accommodate really big baits and will take almost anything offered. Sprats are very good, so also are bunches of lugworm, but you will get sport on mussel, crabs, pieces of herring, squid, slipper limpet - all according to locality. As regards the best fishing time, there does seem to be a preference for a fast running tide, particularly at dusk or dawn, although fish are taken in all weather conditions, rough and smooth. Codling is the term usually covering cod up to about 4lb in weight, though some fishermen may name them by size and not by weight. Thus a codling would be less than 20 inches in length, a fish half as long again would be named a sprag. There are other names used also, coupled with weight and size of fish, such as half-cods and cods. Cod can run to a large size and fish up to and over 20lb are not uncommon. … The cod has excellent culinary properties, though choice would perhaps be given to the larger codling, or Tom-Cods as they are termed, for sweetness of flavour rather than to the larger specimens. Although no event would be settled without accurate scales, it is not difficult to imagine a situation where the following formula could be extremely useful. To ascertain the approximate weight in pounds of a fish: multiply the square of the girth (the measurement to be taken at the thickest point) by the length (from point of mouth to crotch of tail) then divide the result by 800. (All measurements should be taken in inches.) Example: 10in girth squared is 100; length 20in multiplied by 100 is 2,000; 2,000 divided by 800 goes exactly 2½ times, therefore the approximate weight of the fish would be 2½lb. On the same basis, a 30in fish with a girth of 20in should weigh approximately 15lb. In actual practice, it is surprising how accurate this formula is. Perhaps a distinction should be made between the codling and the cod. The cod grows to a great size, twenty-pounders are common; the codling is simply a young cod of about four or five pounds. Codling is to cod as lamb is to mutton. Of course they are exactly the same fish at different stages of growth, but their habits vary a bit. Thus the small stuff seems to hang around, whereas the big chaps come in close only during the autumn and winter. In really bitter weather cod come amazingly close inshore. Whereas very cold water drives most fish offshore to the warmer deeps, where they go to spawn, anyway. … not all anglers are interested in ultra-large cod, especially those who fish mostly for the pot. Codling of between 3-6 lb are a far better proposition for the cook than are the coarse-flaked leviathans. Most of these codling are caught from the open shore. Sea fishing in winter from a boat off the coast is both uncomfortable and hazardous except on very favourable days. Anglers therefore take advantage of the codling's habit of feeding against a beach, especially after dark. In estuaries, on the other hand, winter boating is entirely possible and a boat enables anglers to anchor in the deeper channels where the codling are likely to run. Cod and codling are not very active fish when hooked. They tend to bore around, offering resistance mostly by opening their huge mouths. However I noticed when taking codling from relatively shallow water such as in the Solway Firth and in the Stour estuary at Felixstowe that these fish put up a better fight than those taken from deeper water. They are of course excellent food and Kennedy rates them next to haddock. Myself, I think a well-flavoured codling, properly cooked, is as tasty as anything in British waters, salt or fresh. Fishing for codling is a traditional sport in many estuaries. The best rig is probably a simple paternoster carrying a 3/0 or 4/0 hook. Some anglers use two hooks on double snoods but this presents problems with wind resistance when casting, the baits for codling being fairly massive. Codling are such gross feeders that it is hardly possible to over-do the portion you offer them. Bulky baits such as squid are a favourite as well as large chunks of herring or frozen mackerel. Lug is also a good codling-catcher and thousands of fish are taken annually with this bait. Although large black lug are much sought-after as a codling-bait I myself prefer the softer red type even though they need renewing on the hook fairly often. Mussel is a traditional cod bait. For shore-casting it needs to be mounted as a 'cocktail', the tougher retaining bait - squid, for example - being placed on the hook last. Boat fishing for codling in estuaries means first of all locating a good mark. Without a mark you may well catch a couple of fish or even several fish - but the bulk of the sport will be missed as the codling stream past on the tide. Rough ground that will hold the fish and keep them foraging around is the thing to look for. If the estuary dries out such places can be found at low water. In the case of big estuaries which don't dry out one can only study the charts, watch where local boats fish and conduct trial-and-error drifts. Drifting with a pirk mounted with a single hook is one way of discovering codling marks. In the south-west and west there is a local race of codling which spend the summer offshore in deep water and turn up in estuaries during the winter when the herring arrive. These fish are reddish in the summer - perhaps because they lurk in beds of red seaweed - but they darken on coming inshore and there is then not much to distinguish them from ordinary North Sea codling. These fish are small - from 2 to 6 lb - and they seem to be a different type to the cod of the Severn estuary. They are variable fish and some years they fail to arrive at all. However this is true of all cod, relatively speaking. The inshore migrations, even in the prolific North Sea, are either a bumper harvest or fail to live up to expectations. We still have a lot to learn even about the humble codfish! … Codling are simply smaller cod, under 5lb or so. The great tragedy about cod trawling is the size limit. Logically, the size limit should be after the first spawning year. This way, although the cod is trawled up, it has had a chance to replace itself. This is the way size limits are operated with that other highly commercial fish, the plaice, which spawns at nine inches and can be trawled at ten inches. Even a fast-growing cod will be 4lb before it is sexually mature, and think how many cod under that size are trawled up. And dare I suggest that anglers take more immature fish than mature fish ? … The age of sexual maturity of the cod varies widely. The dense shoals of spawning cod that descend upon the Lofoten Islands off the North West coast of Norway every spring can be anything from eight to 12 years old before they mature. This is a direct result of poor feeding. Around the shores of Great Britain, where the feeding is good, cod can be as young as two or three years when they mature … The growth rate of cod varies with the quality of the feeding. Rich, inshore waters provide a much higher growth rate than deeper, offshore areas. The average growth rate for inshore cod is shown in Figure 1. … Many of the statistics on cod fecundity and growth that form the basis of study today comes from the pioneering work of Michael Graham who, in the 1920s-40s, made extensive studies of cod from the North Sea. His growth rate figures were 3¼in in six months, 6-7in after one year, 10in after one and a half years, 14in after two years, 17in after two and a half years, and 22in after three years. Figures published in the late 1960s by the Ministry of Agriculture, Fisheries and Food of cod growth in the Irish Sea were: one year, 8in (4oz); one and a half years, 12in (¾lb); two years, 16in (1½lb); three years, 20in (2½lb). Thirty years of research has done nothing to invalidate Michael Graham's work or to show any appreciable change in the growth rate of cod despite a considerable reduction in numbers. The record cod was caught by a beginner and weighed 53lb! It is not surprising that legions of anglers are addicted to cod and codling fishing. The smaller fish, up to 6lb, are called codling; everything above that weight is proudly referred to as a cod. We modestly fish for codling, secretly hoping to catch cod. The codling season runs from October to April and codling fishing is therefore essentially an occupation for the hardy winter angler. … Cod are prime white-fleshed eating fish. In most angling circles you would be deemed a bit short in the brain department if you put them back alive, as it would be like emptying the cash register over the side. However, I respect the individual views of each angler, and if your mind is set on the preservation of the species through conservation then by all means return fish. What I should point out, however, is that those fish returned, with the exception of beach-caught fish, have little chance of survival. They have a swim bladder, and when pumped up to the surface blow up with air and are unable to swim back down if released. Some species can have this air bladder punctured by a sharp ice-pick which pops the air bag just behind the pectoral fin. I have done this with 50-lb amberjacks off wrecks in Florida, and it has been proved by tagging that they will survive. Even when that air bladder is pierced, however, the cod can't muster enough strength to get back down to the sea bed, and is simply swept away on the tide. It is better to keep them for eating, than see them go to waste due to misguided conservation efforts. If you catch more than you can eat or freeze down, either find a market for them or simply give them away to friends and relatives. The angler fishing from a clean storm beach in search of cod is most likely to encounter fish under 6lb (3.2kg). These are classed as codling, and are found in large shoals which feed on virtually all marine life forms. When cod are one year old they are about six inches long, and feed heavily on small fish and shrimps and just about anything else which is edible. These small immature fish are often caught in large numbers by anglers, who should treat them with great care and return them unharmed as soon as possible. By the end of their second year these fish will have packed on a lot of weight. Now they will measure up to 16 inches, with an average weight of about 1½ pounds. The legal size limit for taking codling in the UK is 14 inches. At about three years old codling weigh between 4 and 6 pounds, at which age about 25 per cent of fish reach spawning maturity. By the time these young fish are four years old the biggest fish will weigh over 10 pounds, and somewhere in the region of 60 to 70 per cent of fish are mature. 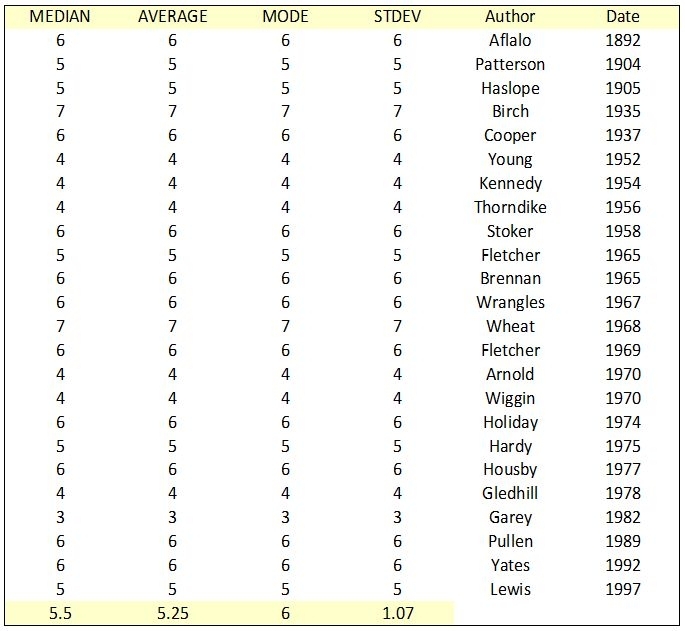 It is worth noting at this stage that anglers in most areas class fish of less than 5-7 pounds in weight as codling, and bigger fish as cod. Sadly, very few cod live to five years old, another reflection on the near constant and heavy commercial pressure which the fish are exposed to throughout their lives. Five-year-old cod average around fifteen pounds in weight. From now on, cod add approximately four pounds of body weight per year , a factor which depends very much on the availability of food, which itself is generally a reflection on where the fish live. Fish in the North Sea and Irish Sea are slow growing when compared with those fish which live in the western approaches to the English Channel, though in this instance these slower-growing fish tend to be more prolific.